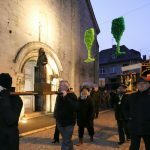 It was bitterly cold and still dark when I joined the Saint Vincent Tournante procession just after 7:30 in the morning a few weeks ago. Eighty different wine alliances (confréries) from all over Burgundy had traveled here to join the hosting group, the Confrérie des Chevaliers du Tastevins in Châtillon-sur-Seine. The Châtillon region is almost exclusively focused on the production of Crémant de Bourgogne sparkling wine. 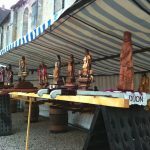 It seemed the temperature dropped even further as the statues of St. Vincent and the banners of the confréries were carried through the pink glow of the winter morning. 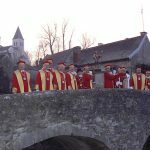 As Burgundy’s winegrowers walked united into the sunrise over the Seine bridge I felt their strong sense of solidarity. All along the way people joined the procession which finished up at the Notre-Dame church. 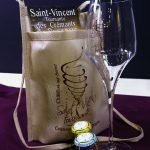 Winegrowing confréries have been around since the middle ages, with Saint Vincent as their patron saint. 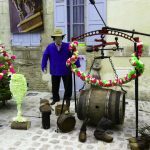 Their main purpose was to provide a system of social security for members of the village in need: they performed a range of activities from looking after the ill and elderly to helping out in the vineyard and the cellar. 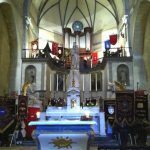 I was amazed to see how deeply the celebration of St. Vincent Tournante is still rooted in religion; a second mass had been put on in the St. Nicolas church for the large following the procession had gathered. 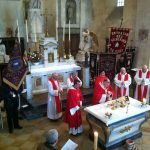 The grand and formal entry of the Archbishop of Dijon and other service celebrants perfectly underscored the importance of this ritual. 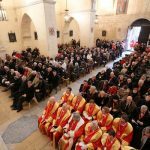 There in the church, the community came together to give thanks for the previous vintage and pray for a good viticultural year ahead. 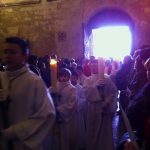 At the end of the service the procession resumed as the confréries followed the altar boys and priests out of the church. In the early morning light we made our way into the courtyard of the Musée du Vin for the annual enthroning ceremony. 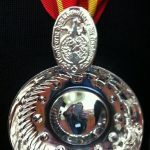 Here the oldest and most important of the region’s local winegrowers were given the Tastevin award and accepted as members of the Confrérie des Chevaliers du Tastevin. 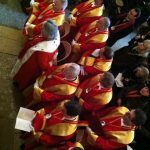 Les Chevaliers du Tastevins, which was created in 1934, actively promotes the great wines of Burgundy and the local cuisine and presently has just under 12,000 world-wide members. 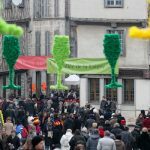 After the official ceremony was closed by the horn blowers of the Tastevin, it was time to warm up by sampling the local Crémant de Bourgogne and exploring the area by daylight. In the Châtillonais sparkling wine region there are three different valleys which contain the 23 winemaking villages. I found that the city of Châtillon-sur-Seine had been divided in three sections to represent each of the valleys. There, each village had its own tasting area within its respective valley where several local producers’ wines could be sampled. Tasting kits which were sold in several locations included a specially designed tasting “flute” and seven tasting tokens. Wandering amongst the crowds, I happened upon several brass bands in different locations. 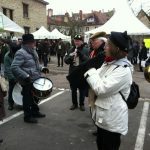 With their impromptu tunes, they enticed us to dance and keep warm in between tasting. 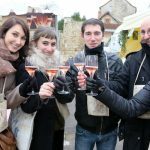 Over the weekend, a total of 30,000 people joined the party and braved the cold to discover the wines of the Châtillonais in a bubbly atmosphere. 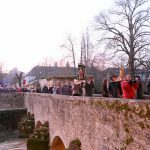 La Saint Vincent Tournante was started in 1938 by the Confrérie des Chevaliers du Tastevin in an attempt to revitalize traditional Burgundian celebrations and folklore. 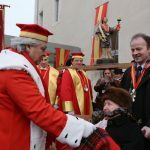 It takes place on the last weekend of January, each year in a different viticultural village or town. 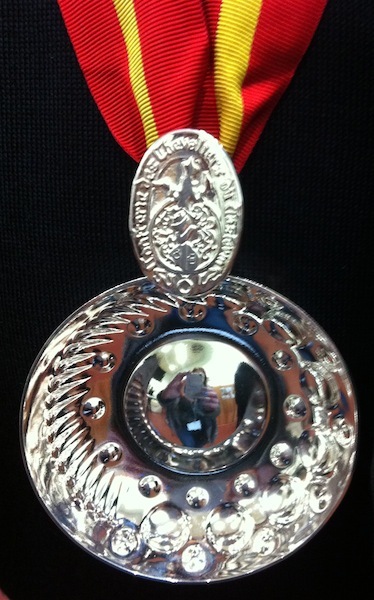 This was the first time in its history that the appellation of the Crémants de Bourgogne was spotlighted. Next year the celebrations will take place in St Aubin, in the Côte des Beaunes. One of the many brass bands playing in between tasting!